I finished up the last few bosses yesterday and now everything in my game has a functioning brain! This is really exciting since it means the game's release date is in sight! I can't wait to get to beta and just playtest this thing. this is the longest I've ever spent on a single project and I want to see it become something. The boss fights are the most interesting battles in the whole game so I'm glad to finally get those playable. Get some descriptions below! The first dungeon master I did on Sunday was the Splash Spell. 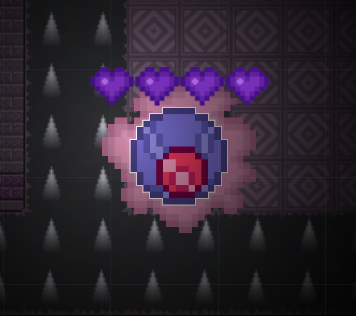 This boss bounces around in its pool while turrets shoot at you. The boss shoots occasionally too. It's pretty simple but gets chaotic if you don't wait patiently for it to align in front of you. I found a glitch with this one where it'd escape the pool so I patched it by forcing it to splash/teleport to the center if it leaves those boundaries. Next up is the Pyre boss. This one travels along all four edges of the stage and shoots toward the center. Catching up to this guy and shooting at it makes it a very mobile fight. To keep the scene interesting there's a bunch of fiery enemies planted here, including Chemballs which can't be seen anywhere other than the fire dungeon. This is also the only dungeon fight to have enemies not constructed by Swirllock. Did he master spawning magic or did I not feel like making a new enemy type..? The Surge boss is a mean one. It's electric balls are huge and easy to dodge but do a lot of damage if they hit. The rods shoot independently of the head and don't take damage. I originally wanted players to have to destroy each one before the head revealed itself and rampaged across the stage but cut it because that would extend this project by a week. I wanted there to be at least one humongous boss just so I can say I made one and this guy is way off the screen! It makes it hard to see how much health it has left unless you make your way to its head and attack there. You can maneuver past the alternating electric gates or use Parax to warp over the pits. The boss with the most interesting look is the Hex Spell master because of the dark shade of the fighting room. 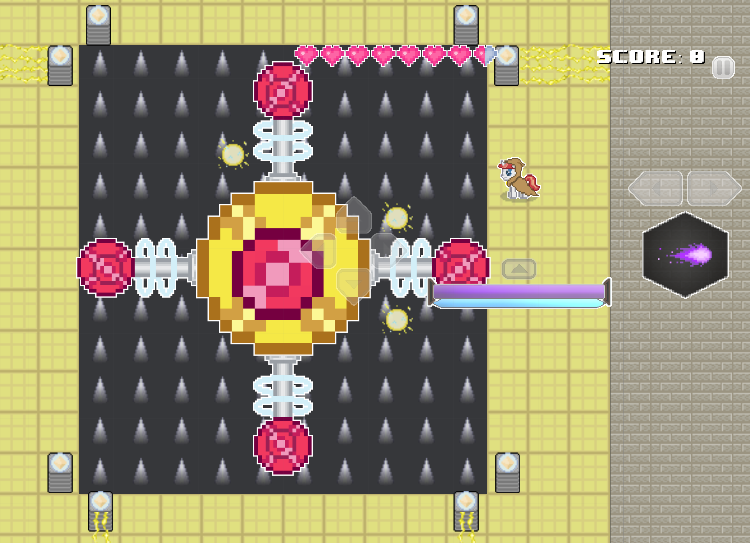 Hex will teleport between the map's 4 corners and shoot big energy blasts at you. Parax comes in handy because the middle of the stage is filled with poisonous hex gas that you'll want to teleport through in order to chase Hex down and beat it quickly.You may also notice a difference in the cloud color between this and the post's header. I accidentally had this boss's cloud sprite switched with the cloud of the next boss, Decoy. 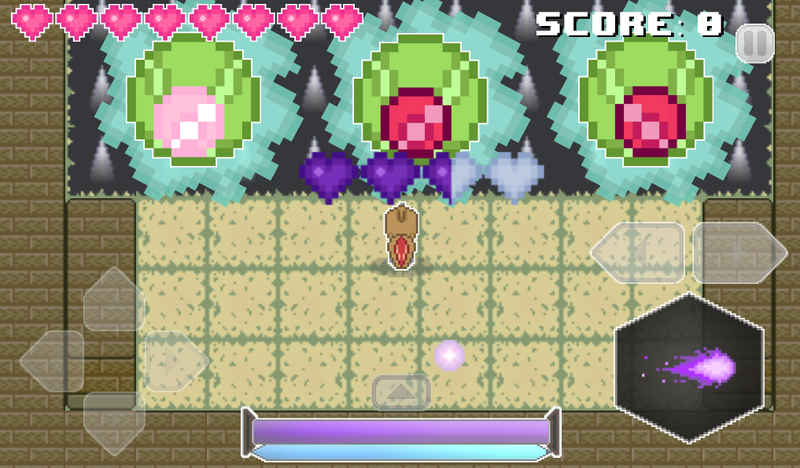 The last boss I did was the Decoy Spell one and I made it a lot simpler than I originally planned. Instead of intricate movement patterns it simply reuses Hex's warp code to teleport to one of three positions then forces it's copies to warp to the remaining two spots. If you shoot a fake, it flashes and stops shooting until the real one warps again. Hitting the real one takes its health but it stil teleports on a time interval. It always warps 0.5 seconds after shooting. With all these done I can move on to the remaining small details and object placements. By the end of this week the game should feel incredibly real and by the end of next Sunday I hope to be done with everything but audio!